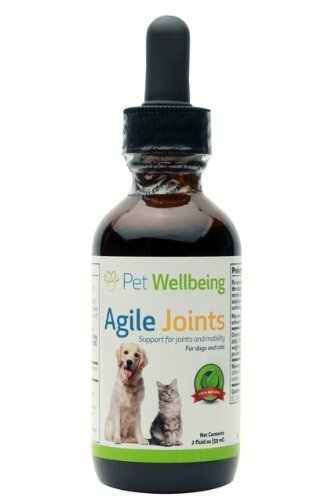 Agile Joints was formulated to address mobility and help maintain a normal range of motion in the joints. Older pets in particular may benefit from extra support. It is common for our pet friends to require additional support for joints and connective tissue. Appropriate for all joints. Commonly used for shoulders, hip, knees, ankles, elbows and vertebrae. This proprietary blend of herbs works effectively to support the physiology of the joint tissues in all sizes and breeds. The joints of the body are made up of the bones of the joint, cartilage that covers the ends of the bones, ligaments and a joint capsule that contains synovial fluid. This fluid works to lubricate the joint and works as a shock absorber when your pet walks, jumps and plays. All of these components need to be comfortable and working smoothly for the healthy function of the joint. Additionally, normal circulation into these areas helps to transport nutrients in and takes waste products out. Agile Joints nourishes the components of the joint tissue by supporting the underlying normal physiology. It also reduces free radical formation that can affect the joint.